I have a confession to make. In the last few years I have acquired a morbid fascination with socialist realism. This is hard to admit, partly because the cult of the Russian avant-garde is so enduring, with countless retrospectives in the US and UK alone. 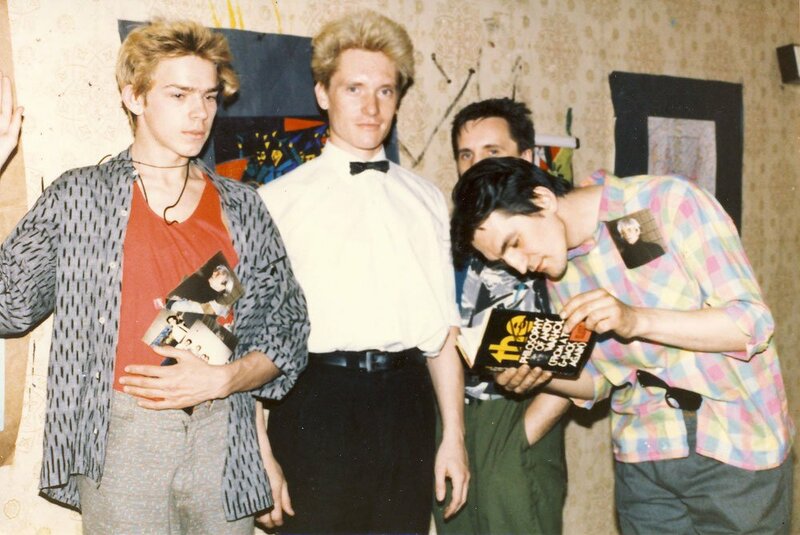 Their successors, such as the Moscow Conceptualists, or Leningrad's postmodernists, for example Timur Novikov, are nearly equally honoured, although mostly in the west; in Russia even after 1991, suspicion towards avant-garde aesthetics did not end. In the opinion of most art lovers, critics and specialists, socialist realism, also known as sots-realism, remains possibly the most rejected period of Soviet art, identified with pernicious politics and backwards aesthetics. For decades, it was a “don't touch” moment of art history. What fascinated me was that it never actually disappeared as a style in the USSR; it lasted the whole Soviet period and as the regime went through periods of softening and hardening, its forms followed suit. Although right-thinking art lovers may see it as insufferably mediocre, boring, ghastly regime art, what is less known is that the realist mode remained dominant for the whole post-1953 period and had many permutations: it flirted with modernist painting and critiques of state policies. Yet this later phase remains mostly unknown, overshadowed by its most blatantly propagandistic early period. The art of this later period is definitely less known and considered less fashionable today than the non-conformist tradition, which stood outside of the strictures of socialist realism. So what should one think of the Institute of Russian Realist Art in Moscow? It is, as if on purpose, located in a hard-to-access former cotton mill in a business park that’s a long walk from Paveletskaya Station in south Moscow. Not on the usual fine arts trail of the Old or New Tretyakovka and far away from the likes of Gorky Park or Strelka, this institute is a curious, privately-owned museum presenting solely Russian realist art on three floors. 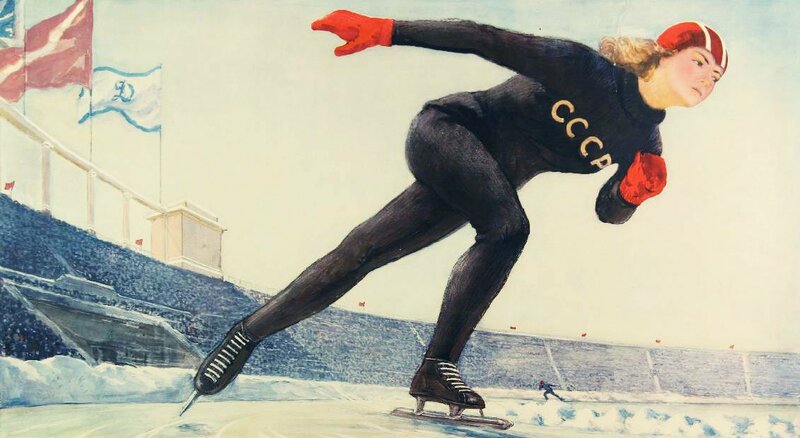 It holds exhibitions, most recently one on Soviet art and sport, which included a half-amateurish portrait of the famously sport-loving Vladimir Putin in judo gear. Situated next to the heavy traffic of the Moscow ring road and surrounded by chain stores and supermarkets, it was so difficult to access from street level that I began to wonder if it was trying to hide rather than boast of its art. When I finally got inside, it was, unsurprisingly, completely empty, like entering an oligarch's private collection. But then a weird journey began. Yes, there were kitschy landscapes and depictions of a majestic Stalin. There was Gorky being embarrassed in a shooting contest by General Kliment Voroshilov in an artwork by Stalin’s court painter, Alexander Gerasimov. 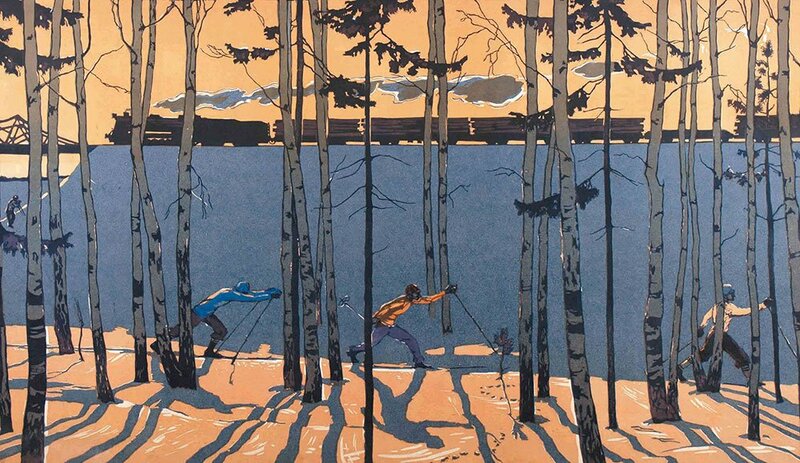 However, these were next to the bold colour and fresh composition of works by Alexander Deineka and Yuri Pimenov. Like the museum itself, contemporary art history, in its rejection of realism in favour of the avant-garde, has decided that both talentless Repin epigones and clear innovators be put into the same sack, a heap of images we do not want to remember but which were the lifeblood of most Russian art production in the 20th century. Realist art in the 20th century has had lot of bad press, and often deservedly so. At its worst, it symbolises a Stalin-directed return to traditional, academic art, a result of an aggressive attack on the avant-garde aesthetics of the 1920s, which had been associated with abstraction and leftist politics. The proclamation of socialist realism as the only acceptable and official art of the USSR coincided with the consolidation of Stalinism. The result was that avant-garde artists were unable to practice their art but were also persecuted, considered “Trotskyite deviationists”, sent to camps or even, in some cases, killed. Some artists — as well as writers, poets and filmmakers — paid the highest price for continuing to practice their art after Stalin took over, including Boris Pilnyak, Vsevolod Meyerhold, Gustav Klutsis and Alexei Gan. What followed is usually seen as the kitschy dross of hideous Stalinist propaganda — brutality rendered in a dour, sentimental way. Although after 1991 most of this art was gradually ushered away from public view, what remains in the big national museums of any post-communist country tells a different story. This is the case with the Institute of Russian Realist Art. Even within the earliest period, at the turn of the 1930s there is variety within the supposedly monolithic style. 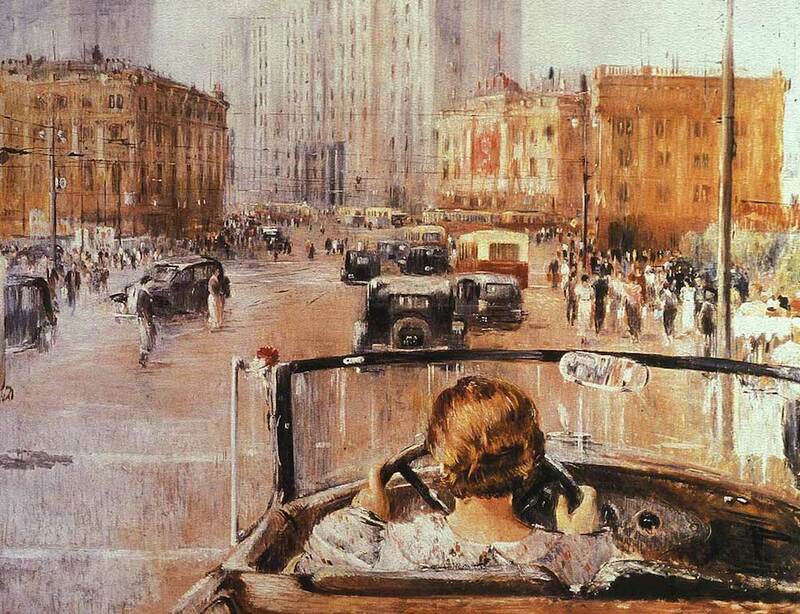 Artists like Deineka, Pimenov, Kuzma Petrov-Vodkin and Alexander Tyshler show how even within the strict, terrifying requirements of the Stalinist period, realist art was influenced by socially critical painting of the time, such as the gritty German realism of Otto Dix or George Grosz. They took as their subject the post-revolutionary period, marked by the compromise with capitalism of the New Economic Policy. In the late 1920s, associations such as the Society of Easel Painters, to which both Pimenov and Deineka belonged, wanted to combine the western modernist approach of schools like Bauhaus with a more straightforward illustration of the positive aspects of life in a communist state. However, Deineka and Pimenov were lucky enough to have developed as realist painters before the full imposition of socialist realism. And perhaps because of that, with the advent of compulsory realism, their style developed a much softer, lyrical aesthetic in order to depict the ideology of a fit, sporty New Man. 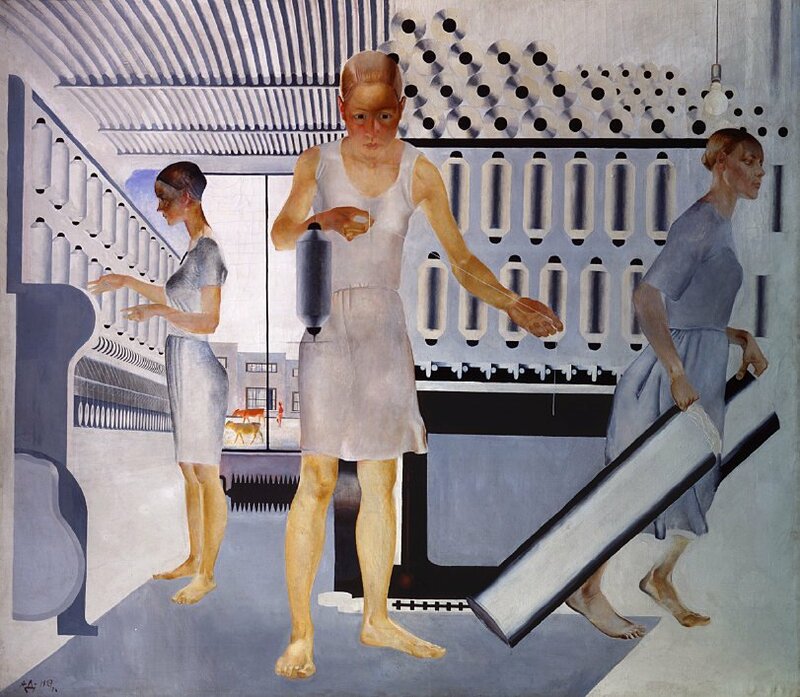 Compare Deineka's delicate Textile Workers (1927) to the full-bodied girls in The Ballgame (1932) or Pimenov's bold, dark, even inhuman steelworkers in Increase the Productivity of Labour (1927) to his pastel-coloured, idealised New Moscow (1937), to see how a stark, otherwordly but weirdly beautiful world of labour is replaced by a softer world of leisure. The hardships of work seem to disappear from the frame for the sake of pleasures of socialist life. Perhaps the problem was not realism as such, but the heroism and idealisation that went with it. What were these painters trying to hide? 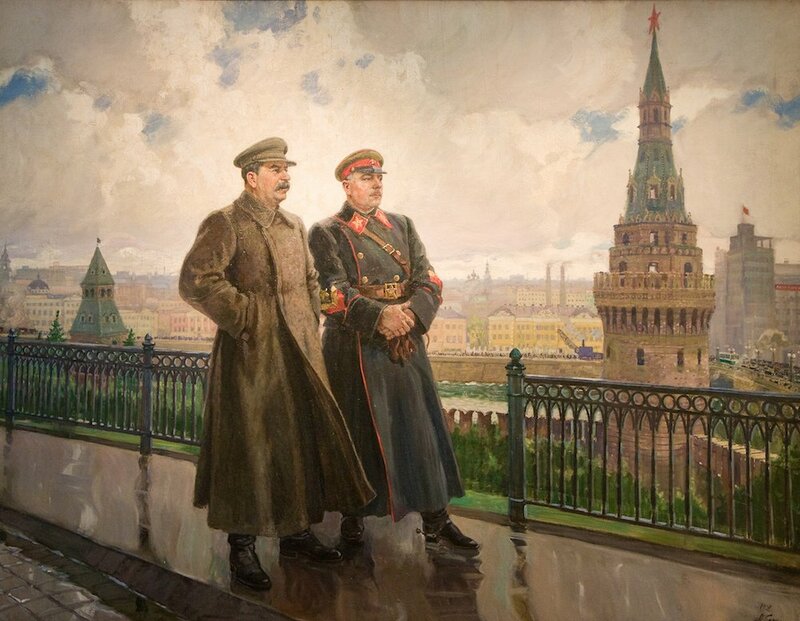 Given the timing of the painting during the period of the intense purge, it is clear what Gerasimov is trying to cover up in his heroic Stalin and Voroshilov in the Kremlin (1938) and why he enjoyed a close and mutually beneficial relationship to the state, developing every aspect of their paintings according to the party line (partiinost’). When Stalin died, the socialist realist style was not revoked, as it was in, for instance, architecture. Figurative art was still to be created under the dictates of party-controlled art academies. 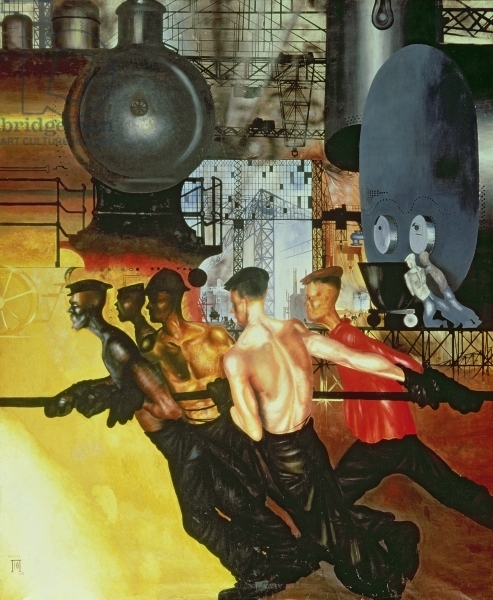 However, socialist realism didn't stand still, but developed into a new kind of realism, called the “severe style”. Inspired by Mexican muralists, the Italian realist Renato Guttuso and even medieval masters like Giotto, artists such as Viktor Ivanov or Evsei Moisenko developed a more humane and pessimistic vision of the working classes. This was realism, but without the characteristic sots-realist idealisation and glorification of Soviet reality. While, after Stalin, first secretaries were not fans of the avant-garde, the thaw ushered in by Nikita Khrushchev was an interlude in which the likes of the young Victor Popkov and the now older Pimenov created fascinating, enigmatic and original forms of realist painting. The examples of Deineka, Pimenov or Popkov suggest we could look at realist art in a different, less punitive way. It could be argued, as Boris Groys has, that realist art acquired the sort of public function that the avant-garde most desired as seen in the value placed on public art in public spaces as well as on and in buildings. This continued after 1953, where severe-style painters and sculptors worked on dozens of commissions in public buildings, housing estates and metro stations. This was a fully democratic style that everybody, even the least educated in society, could understand. Tellingly, from the 1970s onwards, the non-conformists began, as a way to shake off its dominance, to directly confront the realist tradition. If for Clement Greenberg, sots-realism was kitsch, then Sots Art paintings were consciously kitsch. It was yet another manifestation of so-called styob, which can be translated as a kind of “mockery” that involves miming something to such a degree that the original and the parody become indistinguishable. In other words, merging with Soviet ideology to a degree so extreme that it becomes one with it as a way of resistance. Realist art did not per se have this ironic distance, something you can see in the way it fetishised its surfaces, whether it was naive daubs resembling folk art or the ostentatious display of an academic painterly technique. 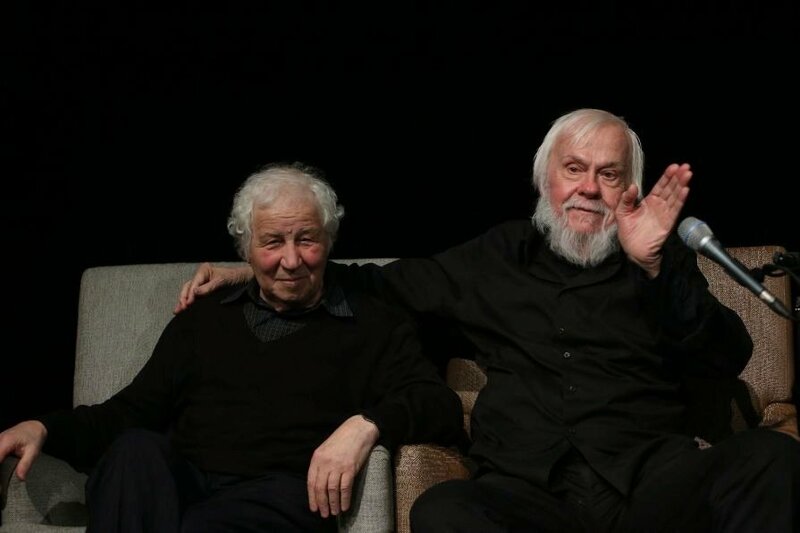 Sots-realism has been widely parodied, in a subtle way by the likes of Ilya Kabakov, and less so by Komar and Melamid, as a form of revenge against the poisonous ideology it came to legitimise. But what is less known in the west, and perhaps more complicated, is what happened to socialist realist art after glasnost and perestroika, or even after 1991, when, at least in theory, it was permitted to practice all kinds of art freely. In the early 1990s, Russia and many other post-communist countries were thrown into a recession and crisis on scale unknown since the Second World War. 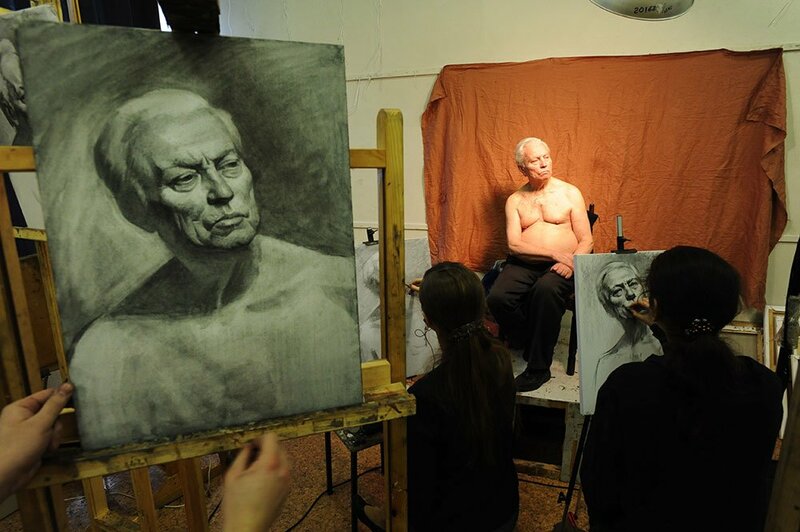 With the post-Soviet world falling apart, this wasn't the greatest time to practice any art. So what happened then? 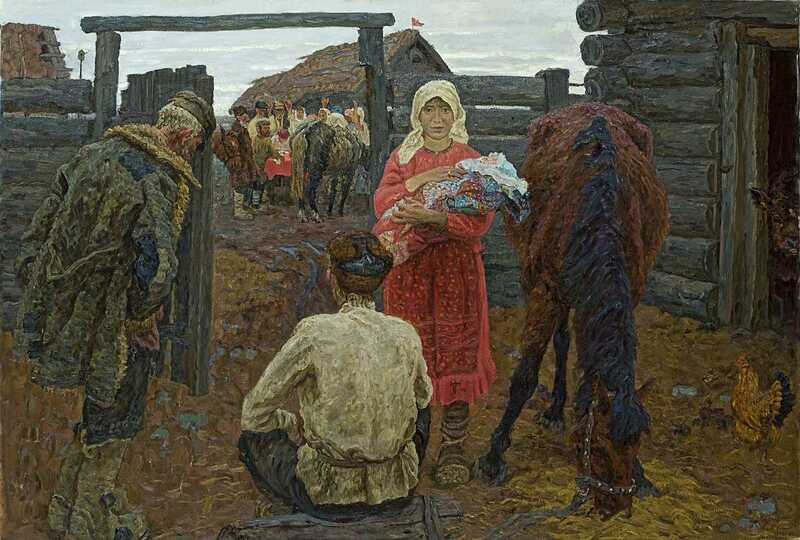 Among the forgotten weirdness of the Institute of Russian Realist Art, we can find the forgotten links between the Stalinist era and the present. We see that even in the aftermath of the collapse, Soviet realists such as Gely Korzhev, Sergey Tkachev or Grigory Tchaynikov were still busy working in the same monumental manner. What were their topics given the great Soviet motherland they had propagandised for had died? Interestingly enough, in the hands of some, socialist realism became a tool for social criticism, as alcoholism, poverty and prostitution were spreading on an unprecedented scale. Korzhev’s work in particular is a terrifyingly realistic testimony to this time. His portraits of the dispossessed, such as the parallel male and female Kvartirantka (Dwellers, 1997), present human decay in a vivid manner. In one, a naked, probably drunk, woman spreads her body on an old dirty mattress, wearing a pioneer's red headscarf. These portraits closely resemble the style of the Neue Sachlichkeit (New Objectivity) and recall Otto Dix’s portrayals of Weimar Germany during the era of recession, inflation and unemployment that set the stage for Hitler. It is one of the sharpest diagnoses of Russia in the 1990s and stands next to Boris Mikhailov’s photography of often naked bodies, devastated by the poverty, homelessness and destruction of this time. Non-conformist artists, partly because they had rejected realism, were useless in portraying this new reality. And yet, many of these late realists would go on to produce propagandistic images for a new Russian nationalism, reminding us that there was a continuity between the late, bankrupt USSR and capitalist Russia. Because of this, it is hard in the end to make up one's mind about the value of sots-realist aesthetics as a viable tool of resistance to oppression. Doesn't the heavy, monumental paintings of Korzhev remind us too much of Stalinist times, the rejection of which for an untamed capitalism pushed us into this misery in the first place? Since the USSR ended, it is the underground artists playing games with Soviet iconography that have been celebrated in the west, rather than these portrayals of the new reality. But in Russia itself there is a less perceived discrepancy between avant-garde and realist aesthetics than is suggested by western accounts. The two genres have similar roots and both find inspiration in Orthodox icons and the lubok (woodcut) tradition. Moreover, the fact that some abstract painters, including Malevich, started to shift towards realism in the 1920s, while other realist painters such as Deineka were clearly modernists in their own way, illustrates that they are not totally distinct. The paintings of the late realists, belated and irrelevant to the time they lived in, perhaps, remain a strange and painful testimony to 20th century Russian history and art. 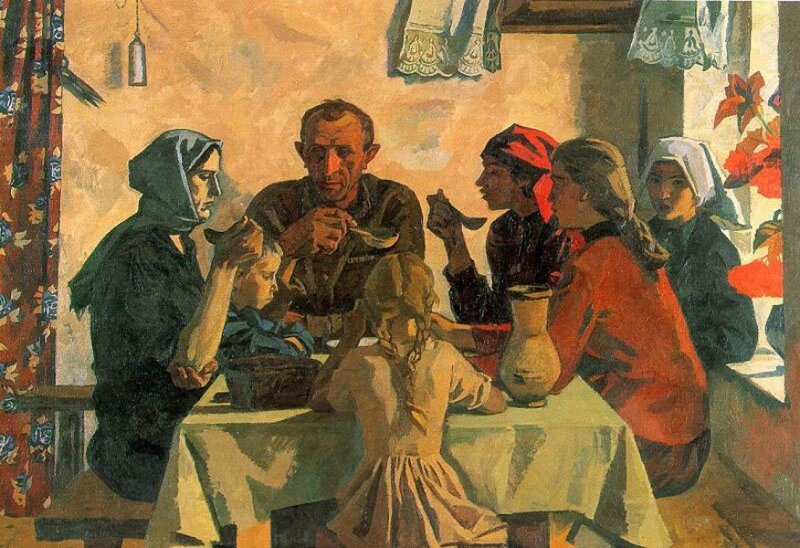 Yet looking at the otherwordly, realist yet uncanny paintings of Deineka, we might see some future Soviet Union that never came to existence.